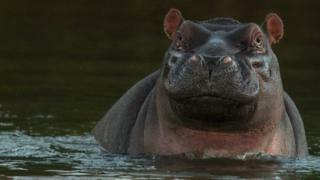 A hippopotamus has killed three adults and critically injured a child in South Africa, a private emergency response service says. The incident happened late on Wednesday night in a town close to the border-crossing with Zimbabwe. ER24 says that when its paramedics arrived at the scene they found the adults had "sustained fatal injuries". The child was taken to the local hospital and is reported to be recovering. The child was discovered on Thursday morning after its cries for help were heard, and that is when the medics were called, ER24 said. The exact circumstances of the attack are being investigated, but it is thought that a wild hippopotamus may have come from the nearby Limpopo River, ER24's Pieter Rossouw told Eyewitness News. Mature hippopotamuses can weigh up to 3,200kg (7,000lbs) and are known for their aggression, says the BBC's Earth website. It adds that they have been named the most dangerous animals in Africa, allegedly responsible for more human deaths than lions.